$20 for an 11x14 Gallery-Wrapped Photo Canvas + Free Shipping! $82.94 Value! I have been wanting to get a photo canvas for so long....I have the perfect picture to use but they're just so darn expensive! Well, I'm happy to say that I finally got one, and for super cheap with a new promo code! 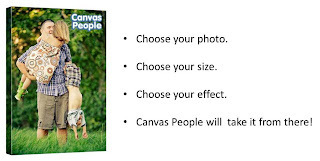 Right now at 8moms, you can get an 11x14 custom gallery-wrapped photo canvas from Canvas People for only $20! This is an incredible savings of 70%! You can also choose a 16x20 for $35. This deal also includes free shipping! The deal is on sale for $25, so to get this price you need to use the code JEWELRYDEC at checkout. You can buy up to 5 deals at this price so you can easily get them as gifts!